The authors also add some wise proverbs here and there. My two favourites were ‘Recite “patience” three times and it will spare you a murder’ and ‘When money talks, truth keeps silent,’ which are from Korea and Russia. …should be on every ESL teacher’s bookshelf! “Compelling Conversation- Vietnam: Speaking Exercises for Vietnamese Learners of Englishand Quotations on Timeless Topics, written by Eric H. Roth and Toni Aberson is a conversation and study guide for students of advanced courses in English as a Second Language (ESL). It provides a variety of interesting and intriguing topics which the class can feed from to help them become more comfortable with learning and speaking a new language easily and effortlessly with others, both in and out of the classroom. Many students who take ESL classes fail to go beyond the basics in grammar, conversation and sentence structure, and comprehending the English language with all of its intricacies. The topics covered in the manual gently challenges students to push themselves into wanting to understand and comprehend even the most difficult of words and phrases. The fact that the student who utilize these conversation topics in a group setting will learn more than just language skills. Several references to history, famous speakers and writers are made in the many quotes used throughout the instructions. The manual has, as the title suggests, a timelessness to its content. Ten years from now the subject matter used will still be pertinent. It is also arranged so that if further editions were published, the book would be very easy to update and enlarge. This book is meant to be used in a group setting. Not only will students learn new words but they will also be exposed to modern social skills and other intricacies of group dynamics. Students will be challenged by the many quotes in this book from famous personalities such as Mark Twain, Thomas Jefferson and Peter Drucker. Many of the sayings are not grammatically correct, opening up more discussion as to dialogue, proper wording, etc. If some of the quotes were actually grammatically correct, they would probably lose their meaning and impact – a great topic for students to discuss. Not only is the book based on American topics, there are also many writers, politicians, and famous people from other countries included such as Maxim Gorky (Russia), Albert Camus (France) and Baltasar Gracian (Spain), which will help students from other countries feel more comfortable in learning English. “This outstanding resource allows teachers to confidently walk into an advanced ESL classroom with self-contained, engaging conversation lessons. The 45 thematic chapters allow you to both evoke student experience with long lists of practical and savvy questions. “Dedicated to his father, Dani Roth—who spoke six languages and ‘could talk with almost anyone’—the book provides an alternative to ‘presentation-practice-production’ approach to language learning, instead using quotations, questions, and proverbs to prompt conversation. Most of the book’s prompts ask for recollections or personal opinions. Roth believes that the English language itself can be liberating. “America is a great land of opportunity. I am sure we all want to get ahead in this country. We want to find the type of employment that is suited for us. We wish to advance in the work world. We wish to make friends. The best way to get ahead in the world is to speak the mother tongue of the country you are living in. In this case, we are talking about English. With so many ‘English as a Second Language’ courses being taught there is no excuse for not learning. The problem is, what book do you use to learn from? Have you been looking for a good ESL manual? If you have, I think this [Compelling Conversations] is one to consider. The topics cover: Your Life, The Civic Life, along with the everyday aspects as dating, enjoying money, handling stress. 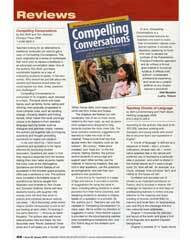 Compelling Conversations is one of my top teaching tools. I have been an ESL tutor of adults for over 3 years, and a classroom ESL instructor for over 4 years. I purchased this book 3 years ago and absolutely LOVE it, and use it daily with the students I tutor, and have also used it in my classroom settings as well. There are a wide range of topics, and the flow of the discussion questions is very natural and lends itself to great conversation. My students really look forward to the conversation section of our tutoring sessions, and have told me that with the chapters in this book, they always learn new words, idioms, and proverbs, in a very relaxed, natural way. I also like the fact that these conversations help to build our friendships too. I would HIGHLY recommend this book!! This satisfying book models and inspires conversations which impart respect, genuine interest, curiosity and individuality. It could easily be used as a source for improving any interpersonal relationship whether it be on the home front, in the work force or a myriad of encounters with people close or unfamiliar. What a gift for any student learning ESL, or for any person who wants to grow in his or her ability to communicate in a meaningful way. Thoughtful and impressive. I cannot praise this book enough. It is an outstanding resource for producing natural, flowing conversations. The students I tutor are well educated adults, rich in culture and experiences. This book allows them to produce natural conversations using what is most intimate to them: their lives and their culture. The result of these conversations is far beyond “speaking English.” I am learning and connecting with my students on a level that helps me identify their desires and needs based on their responses to the questions. Heinz Pagels, the late American physicist, said: “It seems obvious to me that if you want to understand a spoken language, you ought to study the people who speak it and speak it well.” That is the connection I feel to teaching ESL when using this book. As a tutor, I too am sharing my culture and experiences and it enhances the learning process. There are many chapters in this book that can create compelling conversations outside of the ESL environment. If my parents were still living I would use “Describing Family Ties” to learn all those things I wondered about them but never asked. If I were exploring a possible relationship, using “Exploring Daily Habits” could be very insightful. The authors have my deepest respect and gratitude for this outstanding resource. And thank you Amazon for bringing the book to my attention! I tutor several girls from Asian countries, and this book is a great way to get them working on pronunciation and exposing them to American concepts. It’s the best conversationalist book I’ve found. When Compelling Conversations got into my hands I couldn’t help but to think: I wish I had this book when I was learning English! As English as a second language speaker, I can really tell the difference that Compelling Conversations has with other ESL text books: topics richness that takes learning at a higher level. Not only you will feel motivated to improve your language skills, but you will have a rich-provoking theme about life to discuss and share with your tutor or classmates. That in turn makes you grow personally and you certainly will remember the discussed matter here when need it to apply into a situation out of the classroom. You will appreciate American culture as well as other’s point of view. I recommend it to anyone who wants to learn while enjoying the process. Check Out Our Other Books! ©2010-2019 Chimayo Press. All rights reserved.